Michael Kors (KORS) reported Q2 2019 earnings on 11/07 and the stock price dropped ~14.6%. 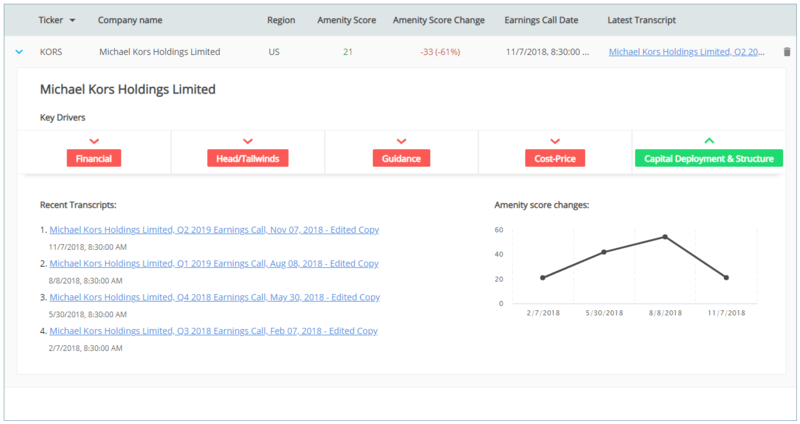 It's easy to spot that KORS missed its revenue estimates, but we used Amenity Viewer to unpack the story behind the company’s operating performance to quickly identify 3 insights that could have easily been missed by analysts. ‍Please note: This in no way represents investment advice. All transcript text provided by S&P Global Market Intelligence. "...decline in retail gross margin of 150 basis points, driven by higher markdowns on our end of season merchandise..."
"Comparable store sales experienced a modest decline in the quarter. This was primarily driven by low double-digit declines in inventory levels and higher markdowns on certain seasonal fashion products"
"Europe revenue was lower, reflecting our strategy in the region to reduce inventories"
"In Europe, our sales declined double-digits for the quarter, in lines with our plan to decrease inventory"
"The indices in markdowns that we saw, unfortunately,they end up being a greater percentage and has impacted the retail gross margin"
"...we drove the inventories a little too low in the company." "We see continued strength in the China marketplace..."
"We have some extraordinary plans for Versace"
The Key Drivers provide a summarized view of the underlying factors behind a company's performance. 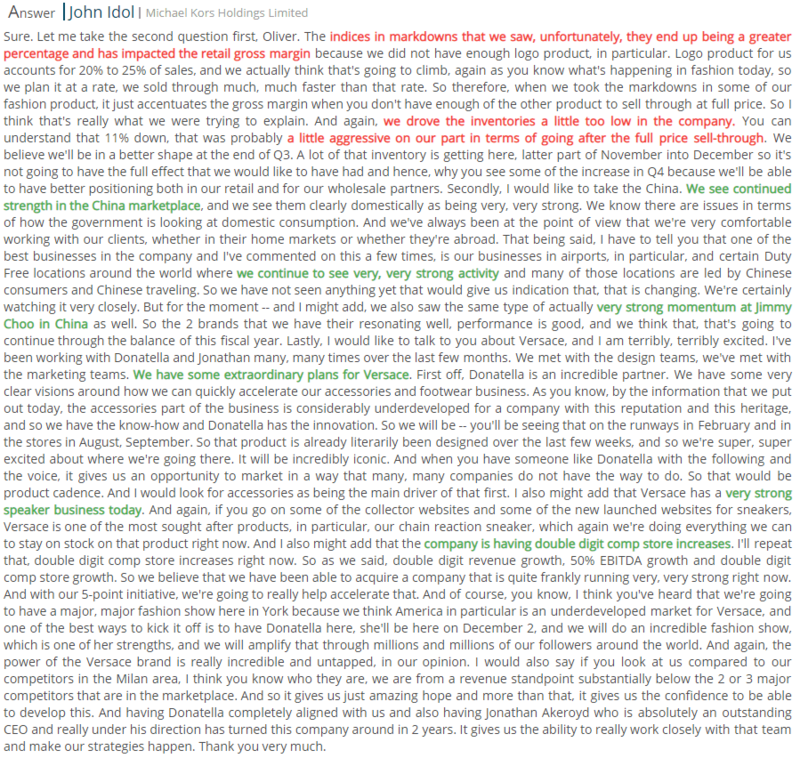 The markdowns and higher costs from the Jimmy Choo business posed as a hurdle. million, including $92 million from Jimmy Choo." "As a percentage of revenue, operating expense increased 420 basis points to 43.7%"
"The indices in markdowns that we saw, unfortunately, they end up being a greater percentage and has impacted the retail gross margin because owe did not have enough logo product"